Good morning everyone! It's a great day around here as this is the last day of school! Woohoo! Summer will begin in a few short hours for my son! He is really excited! A couple of finals and then it's done! And then I will have a freshman? Yikes! What happened?? Lol! We are looking forward to a great summer! And on Sunday my parents will be here! Guess I had better get busy! 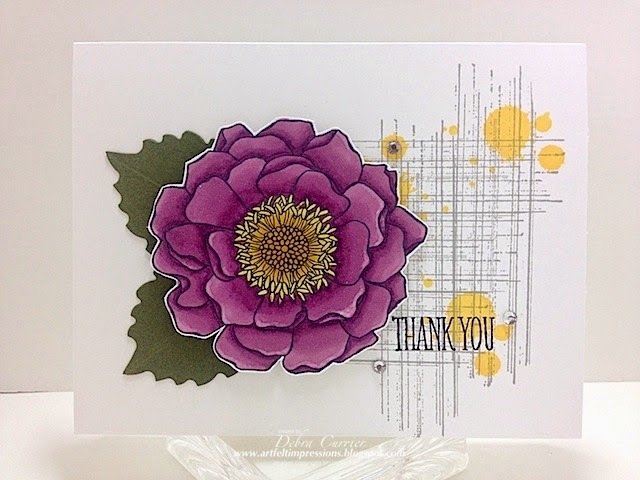 Today's card features the Blended Bloom stamp again along with the blendabilities markers. I decided to add a little grunge to this one. Add a few rhinestones and call it done! What a gorgeous card, Deb! Can't get enough of your clean and classy designs!